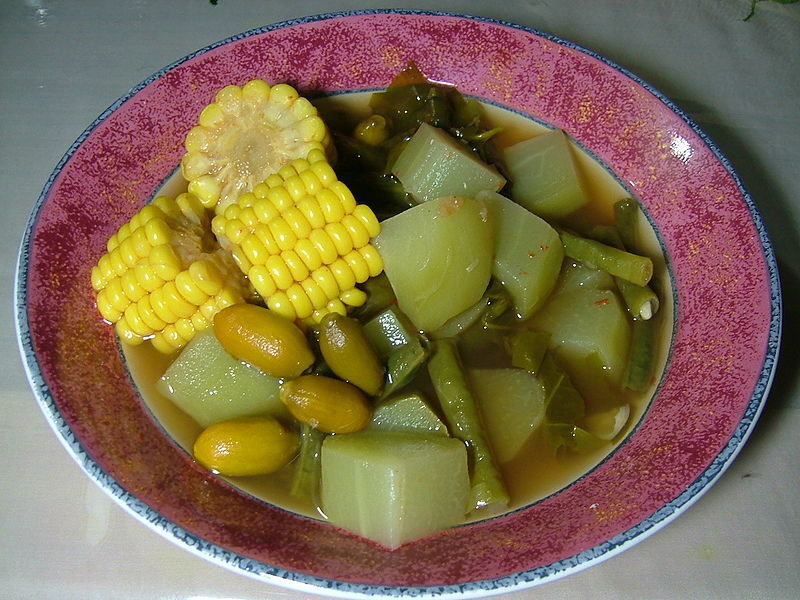 Sayur Asem (sour dish or tamarind dish) is a very popular vegetable soup dish in Indonesian cuisine. Left: Sayur asem, Indonesian vegetable soup. Several variations exist including Sayur Asem Jakarta (a version from the Betawi people of Jakarta), Sayur Asem Kangkung (a version which includes water spinach [kangkung]), Sayur Asem Ikan Asin (includes salted fish, usually snakehead murrel [ikan gabus]), etc. Common ingredients are peanuts (kacang tanah), young jackfruit (nangka muda), Gnetum gnemon (melinjo), bilimbi (belimbing sayur), chayote (labu siam), long beans (kacang panjang), and tamarind (asem jawa). Quite often, the recipe also includes corn. The karo version of sayur asam is made using torch ginger buds and, more importantly, the sour-tasting seed pods. The sweet and sour flavour of this dish is considered refreshing and very compatible with fried dishes, including fish and lalapan (a kind of vegetable salad, raw or cooked, usually raw), and is usually eaten with sambal terasi.